Find Better Ideas, Faster ® with a custom luxury hotel trend report, our PRO Dashboard and 80+ categories of premium trend reports. Viewing the hotel industry through the lens of a consumer who loves to indulge, the Luxury Hotel Trend Report analyzes top designs, services and amenities in high-end hotels and resorts. Examining hotel room layouts and decor, restaurant food and service as well as additional amenities like laundry services, personal shopping and delivery apps, the research offers a comprehensive summary. The report also explores luxury hotel packages that include over-the-top experiences like helicopter flights and caviar tastings. 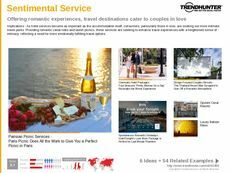 This report is for brands in the service and hotel industry, including hotels, resorts, hostels and bed and breakfasts that want to supercharge the experience they provide guests and integrate the latest service innovations into their brand identity, creating a hotel that is a destination in itself. 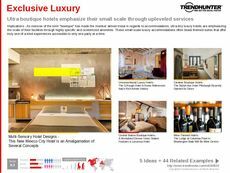 The Luxury Hotel Trend Report is a great compilation of the top upscale hotel experiences, the facilities and customized amenities provided to delight high-end clients and attract new guests.